Development project N R11 0002 10 financed by the National Centre for Research and Development. The project Integrated System for Supporting the Information Accessibility in the Urban Area meets the needs of modern society. We develop a pilot solution utilising mobile technologies, GPS and GIS, which will allow for an easy and user friendly information search about sought-for locations in urban space, to which we devote an increasing amount of time, especially in big cities. The system is developed to make it possible to use it on mobile devices (mobile communication systems), the system’s versatility will allow for its implementation in other Polish cities. The main goal of the project is to develop a pilot version of an integrated support system for access to information in urban space. An ergonomic, aesthetic, and intuitive IT subsystem user interface, which will gather and distribute spatial data consisting the basis of GIS database, will be a significant effect of this work. An innovative solution utilised by the project is the multidisciplinary approach towards information transfer. User groups are studied in many dimensions as part of the project, just as are their needs and data significance criteria. Study results are reflected in developing system functionalities. System users pays most attention to the quality of information, therefore all information in the system is going to be reliable and accessible to users in acceptable time. The information is also going to be available in foreign languages, which will also allow tourists to use the system. Reliability is understood as the best possible state of affairs to obtain, characterised by such features as timeliness, accuracy, clarity, authenticity. Access time is understood as the time from declaring the need to access information, through finding its source, to its comprehension. Fig. 1. 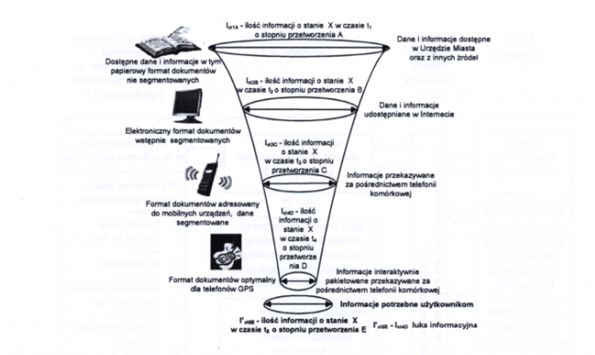 Information flow model in the integrated system for supporting the information accessibility in the urban area. Own work. Conducting system user analysis regarding information and operation, as well as importance of of such needs. Analysis of the potential for utilization of the data kept in the city database (in cooperation with Poznan City Council employees) and identification of constraints in the use of city data in the system being created and possibilities of minimising these constraints. Preparation of IT subsystem project, including preparation of subsystem procedures and manual. Support system and testing and key user requirement fulfilment evaluation. Developing final version of IT subsystem. complete technical documentation allowing for system implementation to search for information in any environment (e.g. big city, urban complex, commune, district, region). Leading the project is the Project Team, which is comprised of researchers from the Faculty of Engineering Management at Poznan University of Technology. Project Team cooperates with the City of Poznan employees.